Students can find a variety of entertainment and other recreational activities on and around the main campus. The Detroit Institute of the Arts (DIA), Detroit Historical Museum, Detroit Science Center, Museum of African American History and the main branch of the Detroit Public Library (picture on the left) all are within easy walking distance. The DIA is one of the nation's largest art museums and offers many regular events, such as concerts and the Detroit Film Theatre (arthouse and classic films). The University's Hilberry Theatre features the nation's first and only graduate repertory company. The Bonstelle Theatre features excellent undergraduate productions. Beyond the University Cultural Center, the metropolitan Detroit area offers something for everyone. The Detroit River serves as the backdrop for summer-long events that include ethnic festivals, Gold Cup limited hydroplane racing, Indy car auto racing, the Ford International Jazz Festival and the Detroit Electronic Music Festival. Detroit's theatres, concert hal ls, and arenas provide the best in entertainment options: Broadway plays and musicals, opera, classical and popular music concerts, art and foreign films, and classic movies. 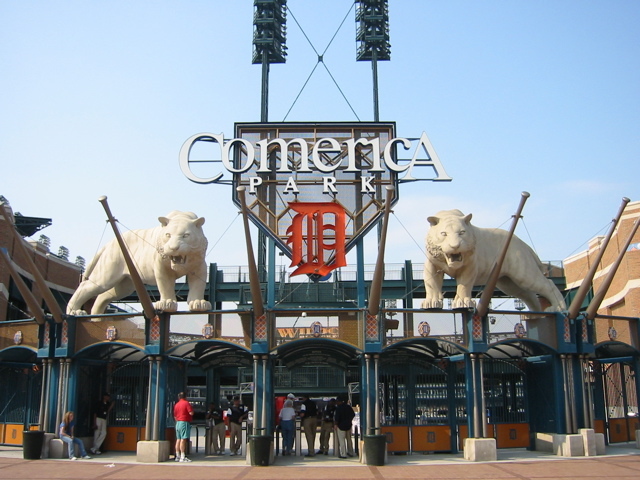 Detroiters are great sports enthusiasts and enjoy cheering for the Red Wings, Tigers, Pistons, Shock, and Lions, as well as participating in a variety of warm and cold-weather sports. Downtown Detroit and the surrounding communities offer many opportunities for fine dining and have many local nightspots for dancing or taking in the Motown sound. Click here for more information on the many fun places and things to do in Detroit. Michigan is well known for its ever-changing seasons, and its beautiful parks and forests. Fall color is spectacular in Michigan. In the summer, Michigan residents enjoy the Great Lakes, hundreds of inland fresh-water lakes, and forest trails. Wintertime brings such outdoor activities as skiing, skating, and sledding. The city of Windsor in Ontario, Canada is just 15 minutes from campus and offers an assortment of shopping, dining, and entertainment activities. Weekend getaways to Toronto, Niagara Falls and other areas in Ontario make international travel simple and inexpensive.